Multi-­instrumentalist Barry Olsen is a native New Yorker who began his career as a teenager in the late 70’s playing trombone in that city’s Latin music (salsa) scene. Over the years he has performed with virtually all the major artists in this field, including Ray Barretto, Eddie Palmieri, Hector Lavoe, Tito Puente, Celia Cruz, Marc Anthony, and La India. He has also performed and recorded with Paul Simon, The Paul Winter Consort, David Byrne, Charlie Persip and many others. 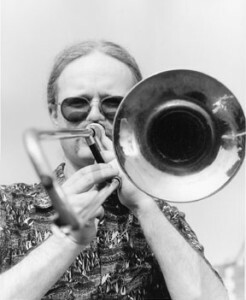 Since 1994 Barry has performed extensively with South African musicians notably appearing on the recording “Ancestral Healing” by South African artist Pops Mohammed, and the CD “Jazzin’ Universally” recorded in South Africa with Airto Moreira, Jose Neto, and many outstanding musicians from that country. From 1994 through 2000 he frequently performed with the jazz group Ingoma, led by the late South African saxophonist and composer Zim Ngqawana, touring with them in Europe and the U.S., as well as in their home country. For over sixteen years he was the pianist for Chris Washburne’s Latin­-Jazz group Syotos and is featured on their five recordings. On marimba and percussion he has performed in the orchestra of the Broadway hit “The Lion King” since 1998. On trombone and keyboards he performed in the show “Fela” (featuring the music of Nigerian afro­beat pioneer Fela Kuti) on Broadway and on tour in Europe and North America. He has released a piano trio recording entitled “Always Climbing” as well as the self titled CD “Mandara”, a quintet he co­leads with his wife and partner Valerie Naranjo. Since 1988 he has been performing Lobi and Dagara music from northern Ghana (West Africa) playing the drums gangaa and kuar, which accompany the gyil (pentatonic marimba). In 1996 he performed with Valerie Naranjo in the Kobine Festival of Traditional Music in Lawra, Ghana, where they were honored as the only non-­Ghanaians to date to be awarded a first prize. He has recorded five CDs in this genre with Ghanaian masters Kakraba Lobi and Bernard Woma.